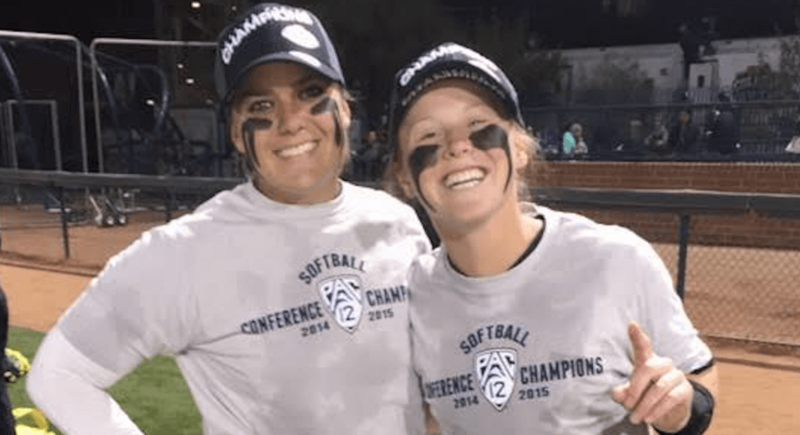 Geri Ann Glasco (left) and Jenna Lilley would win two Pac-12 championships together (2015, '16) and became fast friends even before they played on the same field with the Oregon Ducks. 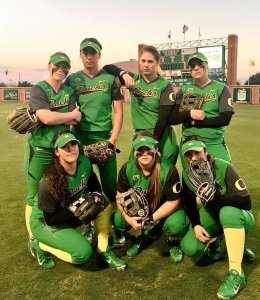 Jenna Lilley and Geri Ann Glasco were Oregon Duck teammates in 2015 and ’16 when the program would go a collective 99-18, but their friendship starting well before that and would continue up until Geri Ann was killed in this week in Lafayette, Louisiana in a multi-vehicle accident. 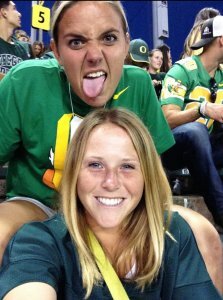 Geri Ann would also be with Jenna during the 2017 season as a student assistant coach when the Ducks would make it to the semis of the World College World Series. Both had prestigious careers before they made it to college. Jenna (left) and Geri Ann would meet while they were still playing club ballin 2012. Here they pose for a photo at the 2012 PGF Nationals. Jenna was an All-American at Hoover High in North Canton, Ohio and led the team to four Div. I state championships. She was also ranked as the No. 1 player in the Class of 2014 by Extra Inning Softball’s Brentt Eads and would have great club ball success with the Beverly Bandits. Geri Ann would lead her Oconee County (Watkinsville, Georgia) High team to a pair of Class 3A state championships, earn All-State honors four times and would be named the 2012 Gatorade High School National Player of the Year. 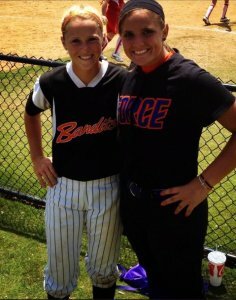 She played travel ball with Southern Force and would play at Georgia for two years--her father, Gerry Glasco, was an assistant coach for the Bulldogs from 2009 to 2014--before she would take the field with Jenna in Eugene. Jenna explains how the two future great friends first met. Eight years ago, you walked into my life. From the moment I met you, I knew you were very special. Getting to know you more throughout high school made me believe that even further. These Duck teammates in 2015 & 2016 would win Pac-12 titles both years. Top row (l-r): Jenna Lilley, Nikki Udria, Stevie Jo Knapp, Geri Ann Glasco; bottom row (l-r): Danica Mercado, Hailey Decker, Lauren Lindvall. We had such a strong connection in our early days of knowing each other... and then two years later our worlds united at Oregon, a place that was brand new for both of us, yet you made me feel so at home. That connection grew deeper and created a friendship I’ll cherish forever. You were the type of person who made those around you feel like they could be their full, authentic selves. You always gave me reassurance and reminded me everything was going to be okay. I confided in you deeply for a long time and knew that I could trust you completely. Your positivity helped me get through my lowest points, and it inspired everyone who was fortunate enough to cross paths with you. I specifically remember the time I dragged you behind a shed at UNLV (2016) worried I was never going to get a hit again (the things we worry about, right?). You let me cry in your arms, told me everything was going to be okay, and that sophomore slumps are a thing ;) We continued to chat as you let me cry into your arms and although I don’t remember what else you said that night, I will always remember how you made me feel. You comforted me, you gave me love and you gave me the reassurance I needed. That’s just one time, along many others, I think back on to remember the type of person Geri Ann Glasco was and will always live on to be in my soul. You were the epitome of what it means to be a great teammate and wonderful human being. You were a light and made everyone around you better. That’s just who you were, G.
I love you and I wish I could tell you that just one more time. My forever teammate, friend, and angel. Our memories will live on forever. For more on Geri Ann Glasco’s accomplished life on and off the field and to make a donation in her memory to the Natasha Watley Foundation-Glasco Family Fund--which is used to “aid and assist young female coaches entering into the softball community"-- click HERE.